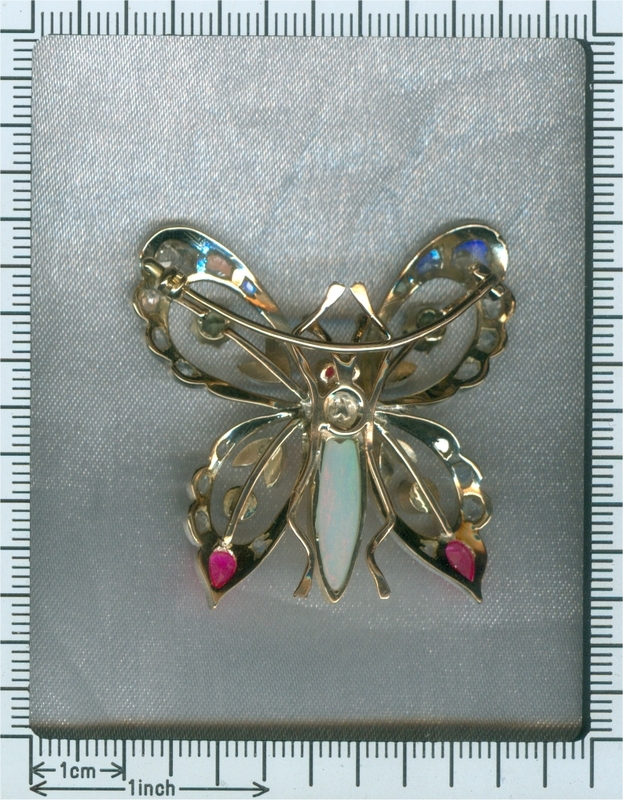 Vintage bejeweled butterfly brooch: Description by Adin Antique Jewelry. 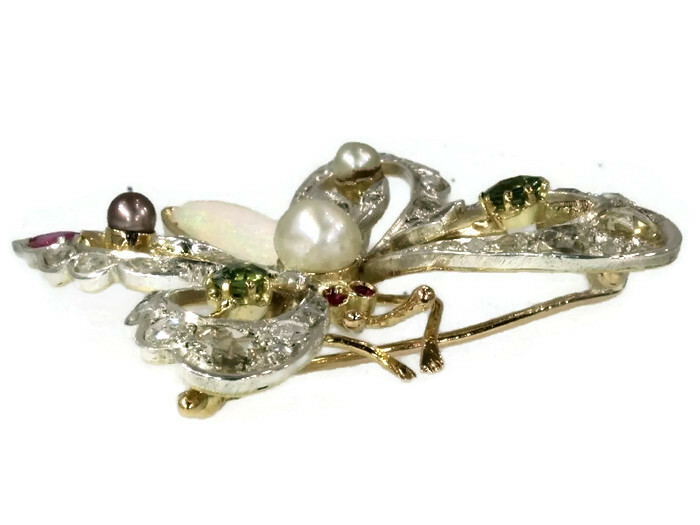 This 18K red and yellow gold Vintage brooch from 1930 depicts a colourful butterfly with silver topped wings attached to a pearl thorax and an opal abdomen. Its slightly convex openwork wings have a lobbed rim of 38 rose cut diamonds with two pear cut rubies as its apices. The wing veins assemble into a flower with two ground leafs and a green spinel for a bloom bud in the forewings and a pearl in the hindwings. 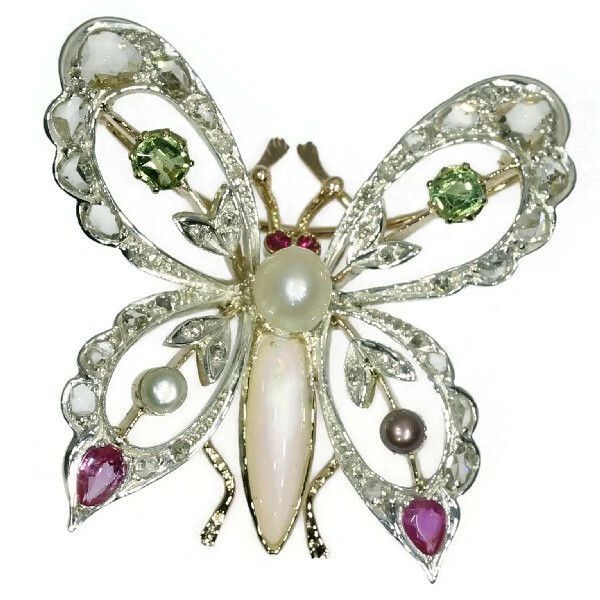 Once this adorable butterfly has landed on your shoulder with its gold legs, you'll see good fortune gleaming from its ruby eyes whenever you wear it. Material: Silver on top and backed with 18K yellow and red gold (see explanation on silver on gold). Extra information: Butterfly - Artistic depictions of butterflies have been used in many cultures including Egyptian hieroglyphs 3500 years ago. In the ancient Mesoamerican city of Teotihuacan, the brilliantly colored image of the butterfly was carved into many temples, buildings, jewelry, and emblazoned on incense burners in particular. Today, butterflies are widely used in various objects of art and jewelry: mounted in frames, embedded in resin, displayed in bottles, laminated in paper, and used in some mixed media artworks and furnishings. Butterfly symbolism - A butterfly was seen in Japan as the personification of a person's soul; whether they be living, dying, or already dead. One Japanese superstition says that if a butterfly enters your guestroom and perches behind the bamboo screen, the person whom you most love is coming to see you. The Russian word for "butterfly", bábochka, also means "bow tie". It is a diminutive of "baba" or "babka" (= "woman, grandmother, cake"), whence also "babushka" = "grandmother". Diamonds: 38 rose cut diamonds. We do not have the weight of the diamonds which is normal in our trade when it comes to rose cuts. 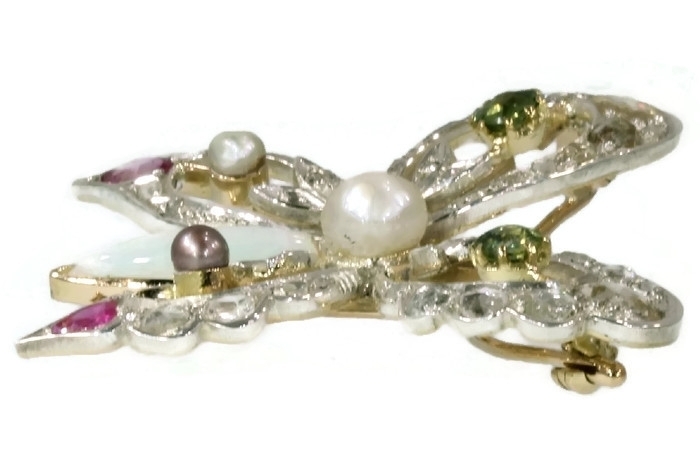 Birthstones: Diamond is the birthstone (or month stone) for April, and opal for October. and ruby for July.